The field desk by We Do Wood was developed by Sebastian Jørgensen and is a flexible and functional table for the workstation at home. The table occupies only a little space and still offers many opportunities for storing office accessories orderly. Laptop, magazines, notebooks, and other bits and bobs can be easily stored in the three flat compartments that are located underneath the worktop. This way the table's surface remains empty and uncluttered. If necessary, the field desk can be quickly and easily disassembled - two specially designed clamps holding the table’s single parts together, see to that and allow an easy disassembly. In addition to the high functionality the field desk is also characterised by its material: It is made of certified Moso bamboo wood. We Do Wood works exclusively with certified plantations and can thus guarantee that the wood grows without the use of chemicals, pesticides, artificial fertilisers or other pollutants. And the actual production of furniture is also performed without any harmful chemicals. Scandinavian handicraft, unpretentious style, high functionality and sustainability – with the field desk We Do Wood wins you over in all regards. The designer Sebastian Jørgensen about the furniture designs for We Do Wood. A look behind the scenes and into the workshop of the manufacturer where furniture of high quality from natural wood is produced. 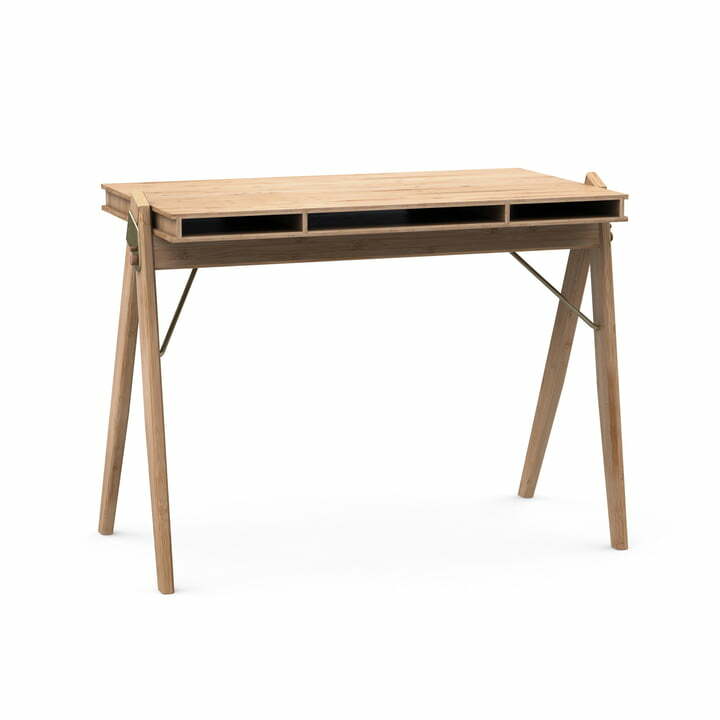 Single image of the Field desk by We Do Wood. The Field Desk is a functional work desk with three flat compartments and consists of high-quality Moso bamboo wood. Side view of the Field desk by We Do Wood. With its slender silhouette and practical compartments, the bamboo desk is a practical piece of furniture for the home office. The Field desk by We Do Wood can be perfectly combined with the Dining chair no. 1 by We Do Wood. The desk as well as the chair are made from high quality Moso bamboo wood. 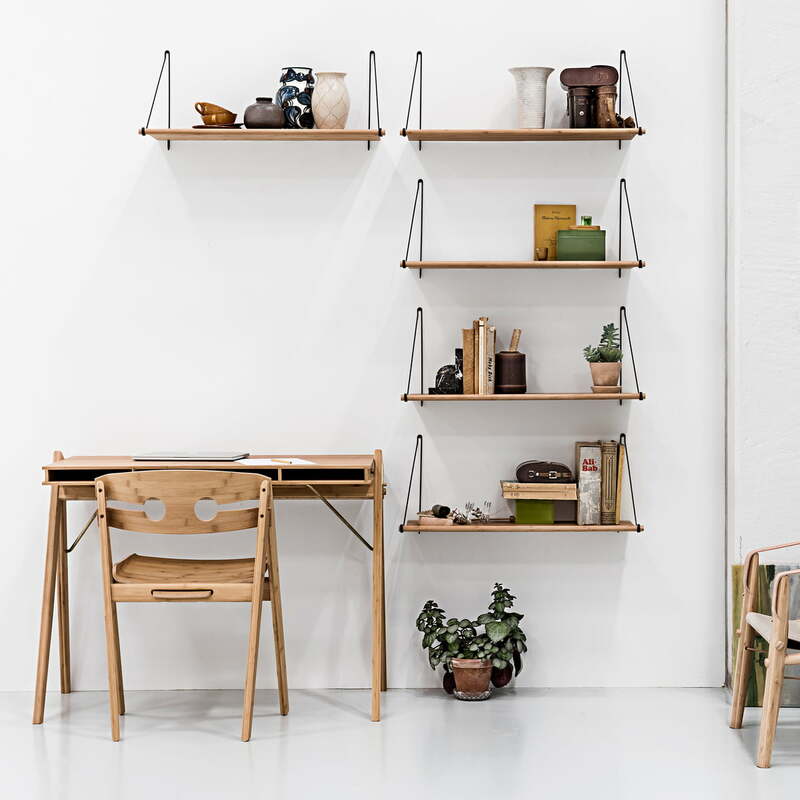 Single image of the Field desk by We Do Wood in detail The desk made of Moso bamboo has shallow compartments for storing office supplies underneath the work surface. Detailed view of the Field desk: The desk is held together by two specially designed brackets, which allow an easy disassembly. The combination of brass and bamboo wood sets special accents. Thanks to the shallow compartments of the Field Desk by We Do Wood, the table always has a clean surface. Suitable to the desk, there is the dining chair No. 1.